Owners of the Mt. Vernon beer bar have transformed former Dougherty's space. Any fan of Dougherty's Pub, the stalwart Irish bar on E. Chase Street, would barely recognize the space now. As the co-owners of Wet City, P.J. and Josh Sullivan—along with their staff—have taken the tiled floor, dropped ceiling, and dark woods of the past and transformed them into a minimalist, bright, Scandinavian-inspired beer bar. "I love that modern and clean feel," P.J. said. "My wife and I traveled to Denmark, Iceland, and the Faroe Islands and I just really like that design aesthetic." 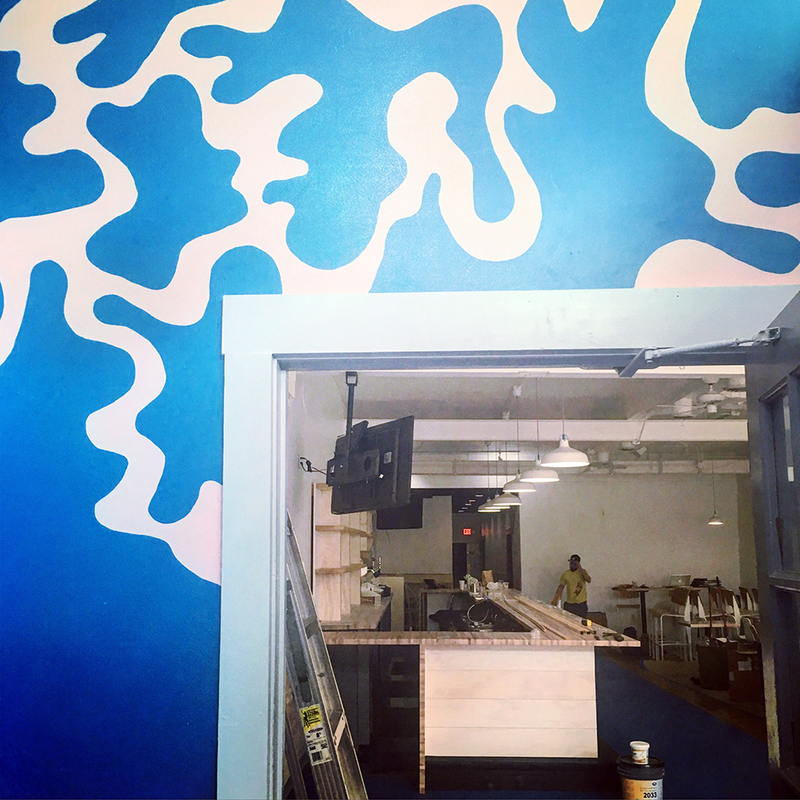 The 3,200 square-foot bar, which will open its doors for Artscape this weekend and have an official grand opening on July 21, is starkly white, cyan, and has some subtle touches of pale pink. A mural in the entrance features Wet City's kaleidoscope-like logo and beautiful light wood accents shine throughout the space. The 15-seat bar, in particular, is a stand-out with a mixed wood pattern crafted by local artists (and engaged couple) Garrett Brooks and Alyssa Zygmunt. The front of the bar has room for two communal tables lined with colorful stools, and there are 15 other two-tops for additional seating. The back room, which Dougherty's patrons will remember as the pool room, is still under construction, but will eventually be an event space and a small one-barrel brew house. Beer is, indeed, what Wet City specializes in since the brothers have been home brewing for several years (and have earned awards to boot). The beer list includes 20 drafts (one nitro) with beers imported from Omnipollo out of Sweden and Weihenstephaner out of Germany; locals from Union and Stillwater; and their current house beer, a black saison they collaborated on with Handsome Beer Co.
"We've completely gutted and installed a brand-new tap system," said P.J., citing the fact that customers can get beers in both 8- and 16-oz. pours. "We want our beer not to just feel like a product, but more like an experience." 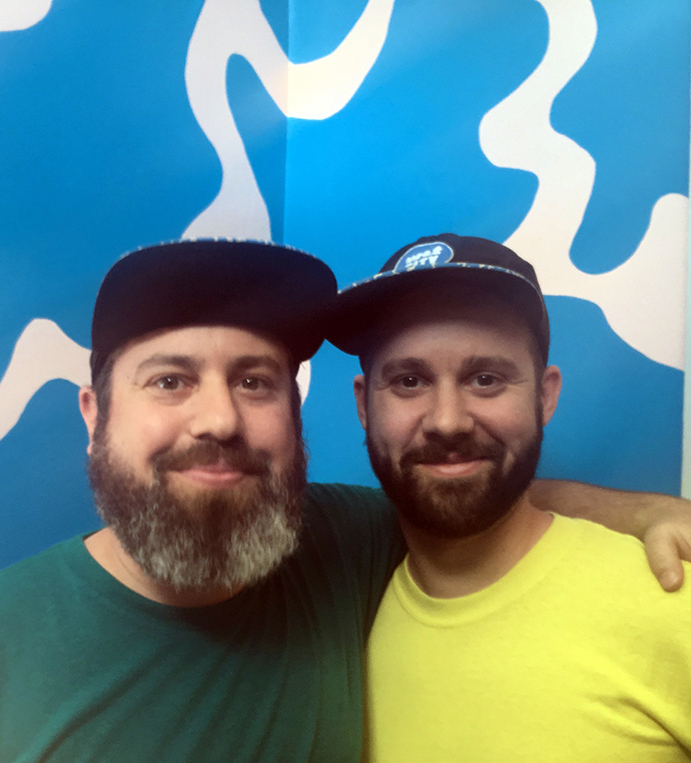 Josh will be handling the cocktail side of things with creative ideas like a margarita made with Gose beer and a Japanese-inspired cocktail with yuzu juice. He's hoping that his years of experience, founding the cocktail website Post Prohibition, will be able to shine behind the bar. "This will be a fun playground for me," he said. "Getting to work with other talented bartenders here will be a great boost creatively." The food menu, helmed by Chuck Allen formerly of Sascha's, looks just as fun with options like popcorn carbonara, wasabi calamari, and summer tacos. "We specifically wanted to be in Mt. Vernon," P.J. said. "You get the most interesting people around here, the architecture is beautiful, and it feels like home to us. Plus, we've got an eight-minute walk to work." Long-term steps for the brothers include installing on-site brewing and renovating the second floor, which they also own. For now, though, Wet City is opening its doors at 2 p.m. during Artspace for people to come in, check out the space, and have a few beers. "The space is not nearly perfect yet," P.J. explained while Josh typed out purchase orders on his laptop and their dad, Pete, sanded wood in the corner. "But we are just a family business and are excited to evolve as we go."